The Mutation Generation and Detection Core (MGD) Facility specializes in providing custom TALEN and Crispr-Cas9 DNA nucleases to induce targeted mutations in a genomic region of your interest. TALEN and Crispr-Cas9 DNA nucleases are a cutting edge technology for performing reverse genetic studies in multiple model systems, including, but not limited to Zebrafish, Drosophila, C. elegans, Mouse, and mammalian tissue culture. The MGD Core also offers services to identify induced mutations using High Resolution Melt Analysis (HRMA). Our support includes hardware, reagents, and expert advice for optimizing and performing HRMA for your gene of interest. The MGD Core also offers Services for preforming custom HRMA analysis for mutation detection and genotyping. Please contact the Director of the MGD Core for details on this service. CRISPR-Cas9 is a customizable system for assembling DNA nuclease that are RNA:Protein hybrids. CRISPR-Cas9 is analogous to the TALEN DNA nuclease system and can be used to induce mutations at targeted regions in a model organism’s genome. 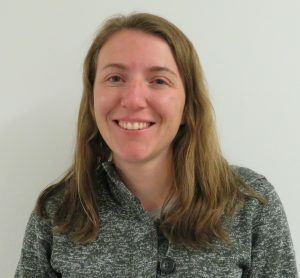 Targeting of a gene’s coding region using CRISPR-Cas9 leads to null mutations and loss of that genes function and allows investigation of that genes role in the normal biology of a model organism. In addition to this basic “knockout” function CRISPR-Cas9 can be used to make small and large deletions of genomic regions and to increase the efficiency of incorporation of exogenous donor DNA (homology driven recombination). Together these different uses of CRISPR-Cas9 can be utilized to knockout a gene, tag a gene, delete genomic regions of non-coding RNA, or delete regulatory regions of genes such as promoters and enhancers. Our Core offers a full line of CRISPR-Cas9 services and reagents to researchers, as well as help designing and implementing projects. All projects start with the Core designing optimal CRISPR-Cas9 target sites for your model organism and delivery of sequence confirmed plasmids. See the list below for a range of CRISPR-Cas9 services and pricing. Also provided are links to order forms if you are interested in services. For any questions and to submit order forms please contact the MGD Core at mutrus@genetics.utah.edu. TALENs are customized DNA nuclease proteins used to induce mutations at targeted regions in a model organism’s genome. Targeting of a gene’s coding region using TALEN proteins leads to null mutations and loss of that genes function and allows investigation of that genes role in the normal biology of a model organism. In addition to this basic “knockout” function TALENs can be used to make small and large deletions of genomic regions and to increase the efficiency of incorporation of exogenous donor DNA (homology driven recombination). Together these different uses of TALENs can be utilized to knockout a gene, tag a gene, delete genomic regions of non-coding RNA, or delete regulatory regions of genes such as promoters and enhancers. Our Core offers a full line of TALEN services to researchers, as well as help designing and implementing projects. All projects start with the Core designing optimal TALEN target sites for your model organism and delivery of sequence confirmed plasmids expressing TALENs. See the links below for the range of TALEN services provided, directions for ordering, order forms, and pricing. For any questions please contact the Core at mutrus@genetics.utah.edu. High Resolution Melt Analysis is powerful assay for the detection of sequence alterations that is a closed-tube, high-throughput, and highly sensitive system that can detect a wide range of sequence changes including: insertions, deletion, and SNPs. HRMA can be utilized to identify TALEN and Crispr-Cas induced mutations, for routine genotyping of model organism, or for SNP screening. The MGD Core exists to help researchers like you to further their science. If we could ask for a slight favor in return for that help we would greatly appreciate your help. The University of Utah determines the impact of individual Core’s on scientific research by how many papers mention the Core specifically in the Acknowledgements section. Thank you to the University of Utah Mutation Generation and Detection Core. Perfect for making CRISRP sgRNA RNA for injection into embryos, transfection into cells, or for use in vitro. Can be paired with commercially available Cas9 protein to produce a functional CRSIRP RNP (ribonucleoprotein) complex or with Cas9 mRNA. This construct can be linearized to produce dsDNA template for any RNA in vitro transcription kit. The following link is to a protocol on how to linearize the T7 Construct, how to make RNA in vitro, and how to purifiy that RNA. These protocols are only general guides. Viral accessory and envelope constructs available upon request. Engineered DNA Nucleases systems, TALEN and CRISPR-Cas9 (ZFNs before them), have allowed certain specific experimental questions to be answered using Model Organisms or Vectors where this was not possible before. The basic thing to remember is if there is an embryo or cell that you can inject with mRNA/DNA or transfect plasmids into expressing an Engineered DNA nuclease then you can do any of the techniques mention on our website: targeted mutagenesis, deletion, tagging, etc. Engineered DNA nuclease have been successfully used to alter a genomic locus in 13 different invertebrate models organisms, 13 different vertebrate models organisms, and 12 different plant species Organisms List. Below is a listing of the Model Organisms for which our Core has produced successful DNA nucleases along links to papers for examples. For our whole list of MGD Core publications, please click here. The Mutation Generation and Detection Core guarantees delivery of sequence confirmed plasmids to express TALEN or CRISPR-Cas9 DNA nucleases or delivery of plasmids for the expression of TALE activator or repression proteins. However, we cannot and do not guarantee that these delivered plasmids will lead to the recovery of somatic or germ line mutations at your targeted genomic locus or will cause activation/repression of your gene of interest. The MGD Core will do everything reasonably possible to assist you throughout the process. Our main goal has always been to support scientist and help further their research. If the plasmids provided by the MGD Core do not produce the expected affect please contact the MGD Core as we have protocols in place to deal with these specific situations. As of May 2016 ~80% of the TALEN and Crispr constructs the MGD Core has made and delivered to researchers have confirm activity at the targeted locus. Lonza’s 4D Nucleofector™ Technology is an improved electroporation technology that can help researchers achieve high transfection efficiencies in standard cell lines, primary cells, stem cells, and hard to transfect cell lines. With the 4D Nucleofector high efficiencies can be reached using much lower substrate amounts and with moderate impact on viability. The comprehensive way in which 4D Nucleofector™ Programs and cell type-specific solutions are developed enables nucleic acid and protein substrate delivery not only to the cytoplasm, but also through the nuclear membrane and into the nucleus. This allows for high efficiencies up to 99% and makes the transfection success independent from cell proliferation. Core Unit – The main control center for the 4D-Nucleofector System that controls the function of all other units. It has a 5.7’’ touch screen to operate all units and is loaded with intuitive operation software for designing and saving individual experimental setups. X Unit – This base unit allows Nucleofection of cells in suspension in 20ul Nucleocuvette 16-well strips or in single-use 100ul Nucleocuvettes. Each well in a 16-well Nucleocevette strip is electroporated independently allowing for different conditions to be tested and re-use of the strips if wells are not used. This unit is perfect for testing individual conditions on cells and for small-scale experiments. Y Unit – This unit allows Nucleofection of cells while still adherent to 24 well culture plates. This unit is perfect for working with adherent cells, such as neurons derived from stem cells, which are not transfectable in suspension. Transfection of adherent cells using the Y unit may lead to more physiological response in cells. 96-well Shuttle – Controlled by the Core unit the 96-well Shuttle is an add-on unit that allows for convenient optimization of conditions or large-scale screens to be preformed. Each individual well is processed independently allowing 96 different experimental conditions to be tested at one time. 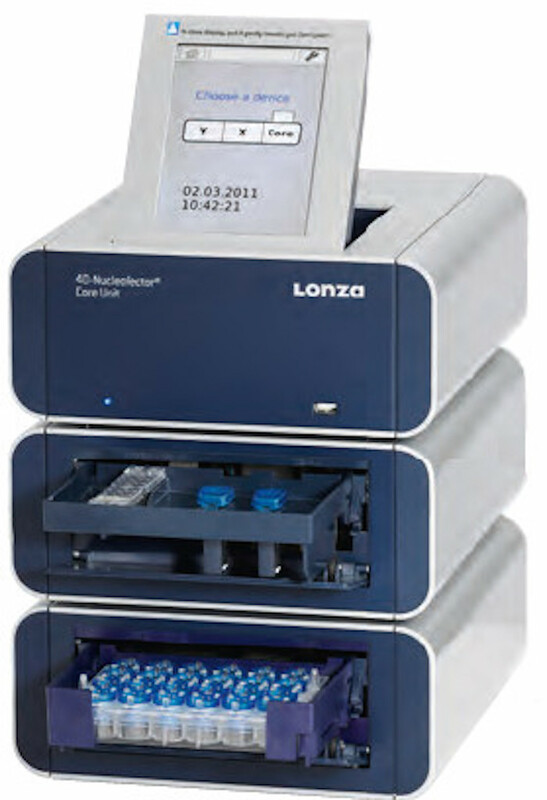 The full Lonza 4D Nucleofector System is housed in Room 7470 of the Eccles Institute of Human Genetics, along with a cell culture hood for researchers to work with their cells in and a 37C incubator to store their cell. To reserve time to use the Lonza 4D Nucleofector System please use the following link to login to the HSC Core Research Facilities resource page. Select the Mutation Generation page option and then select the 4D Nucleofector page option. Here you can reserve time to use the System. Researchers will be charged a $5.00 fee for every 30 minutes block reserved. Individual experiments do not require more than one 30-minute block. 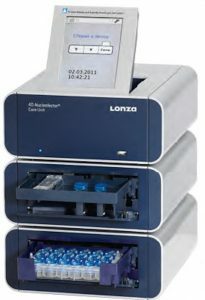 Lonza maintains two databases with protocols (including Nucleofector Solution types and program numbers) of optimized protocols for a wide range of cell lines. Basically Lonza has already done the optimization experiment and determined the best conditions to achieve the highest transfection efficiency with the least amount of cell death. These databases are a good starting place to determine the most optimal protocol for working with your specific cell line. Original CRISPR-Cas9 experiments were performed using DNA vectors, viral vectors or RNA transfection to produce the components of the system: Cas9 protein and single guide RNAs (sgRNAs). New advances have demonstrated that these component can be produced and combined in vitro to form a ribonucleoprotein complex or RNP that is functional in vitro and in vivo without the need for transcription or translation. This CRISPR RNP complex a can be delivered directly to cells and results in immediate, efficient, and specific target cleavage by the CRISPR RNP. 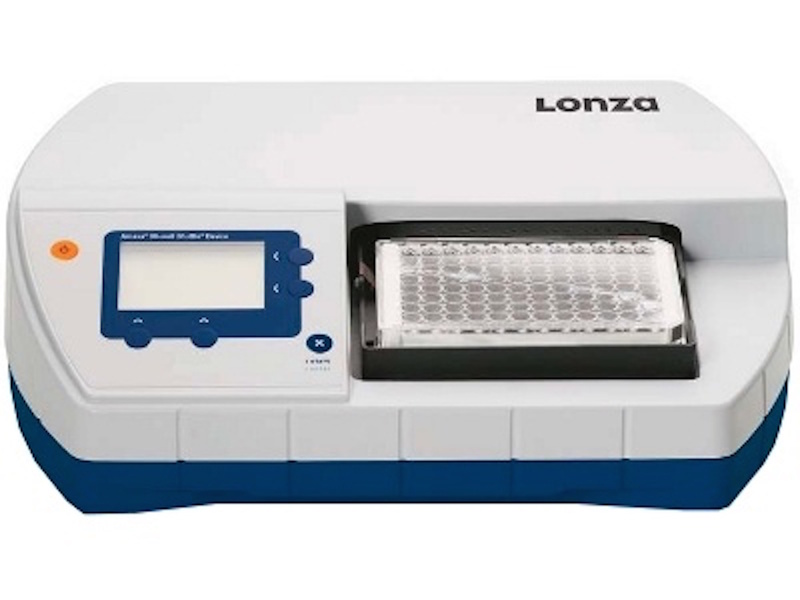 Several labs have shown that combining the CRISPR RNP approach with the extremely high transfection efficiency of the Lonza 4D Nucleofection System can result in mutation frequencies reaching 90% of targeted gene copies in several different cell types. CRISPR RNP delivery is applicable to a wide range of cell types, including established cell lines, primary cells, adherent cells such as primary neurons, iPCS, and stem cells. With these cell types using the CRISPR RNP approach can dramatically shortened the time it takes to create targeted variants of your gene of. Please contact the MGD Core if you have any questions concerning this approach or would like to discuss the possibility of using CRISPR RNP in your research. Also, the following link is a generalized protocol detailing how to combine the CRISPR RNP approach with the Lonza 4D Nucleofection System.